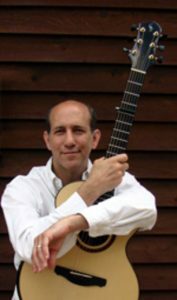 For nearly four decades, American fingerstyle guitar wizard Richard Gilewitz has fascinated listeners with 6 and 12-string finger gymnastics while spinning enchanting yarns of a seasoned raconteur. His concert performances around the world spill over with unexpected turns of the funnies, thought-provoking takes on life on the road, and tunes that propel the audience on a magical journey of sight and sound. His signature playing style delivers a technical diversity of banjo style patterns and classical arpeggios with a rhythmic percussive approach, exploring the history of guitar with sounds of folk to Americana, the blues to the classical, ragtime to pop, and somewhere in between.